Miriam Khalil in BOUND, Against the Grain Theatre, 2018. Photo: Darryl Block Photography. 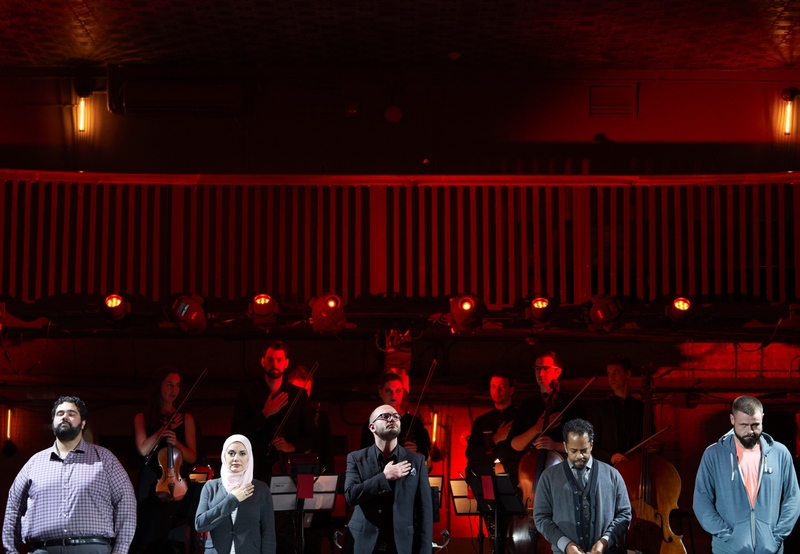 Monday night, we were back in The Great Hall in Toronto’s west end as Against The Grain Theatre opened their run of the next step in their ongoing development of BOUND, a new opera by composer Kevin Lau. BOUND tells the story of four individuals (whittled down from seven in v.1) who are incarcerated by “The State” for various forms of civil “disobedience”. We have a doctor trying to return to his home country after obtaining his training from “The State”, a hijab-clad feisty journalist, a transgendered man, and a Muslim convert in individual cells undergoing interrogations. (l-r) Andrew Haji, Miriam Khalil, Topher Mokrzewski, Justin Welsh and David Trudgen in BOUND, Against the Grain Theatre, 2018. Photo: Darryl Block Photography. Using the music of Handel, and with libretto written/compiled by AtG Artistic Director Joel Ivany, Kevin Lau has interwoven arias and ensembles with his own musical language deconstructing the Handel from an orchestral point of view. Using electronic soundscapes provided by Acote, including samples of Martha Burns who portrayed the voice of The State in v.1, the soundscape was decidedly modern with a strong Handelian presence. 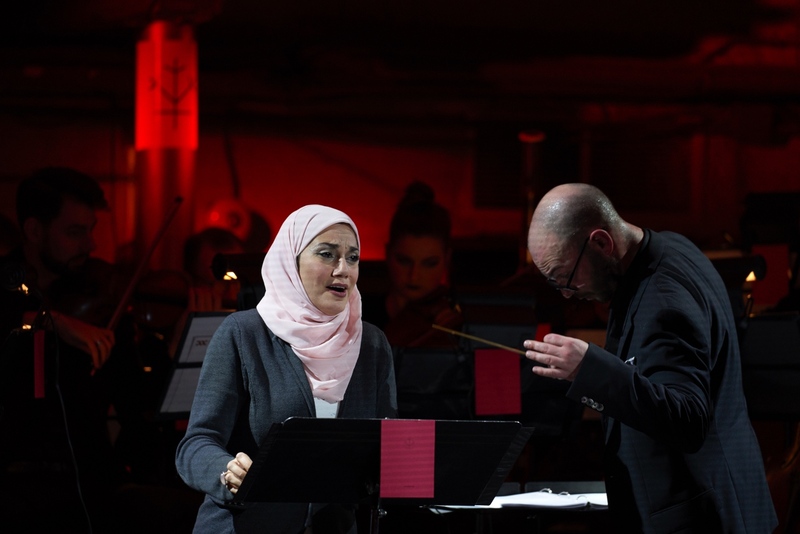 Playing the journalist Noor Haddad, soprano Miriam Khalil sang with a fire and clarity that rattled the bricks. Delicately manoeuvring through her range and expressing a myriad of complex emotions. Tenor Andrew Haji sang the role of the doctor, Naveen Dewan. Haji’s agile, effortless tone was perfectly matched for Handel. 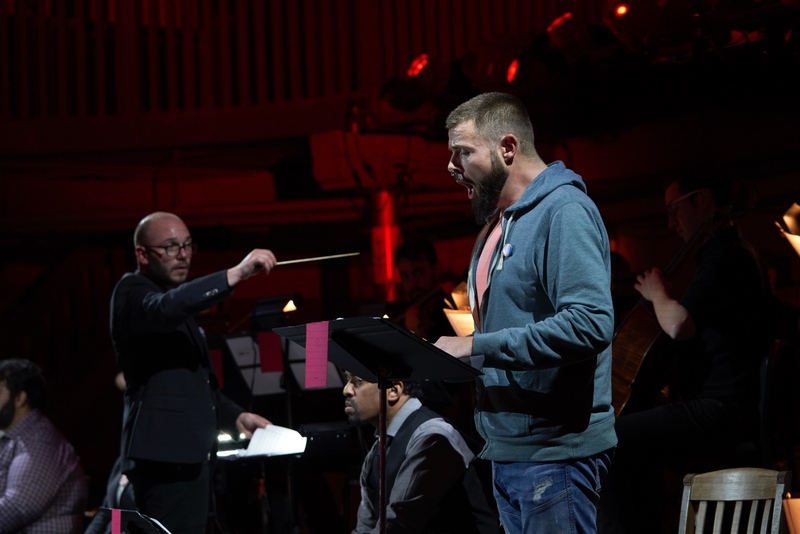 The Muslim convert Ahmed Habib was ably sung by baritone Justin Welsh. The highlight of the evening was probably countertenor David Trudgen as the transgendered Kelly Davidson. He exploded out of the gate with fiery diction and thrilling coloratura. The quartet when singing together created some gorgeous music. I was particularly entranced when their original Handel found itself juxtaposed against what sounded like a dissolving orchestra behind them. The effect was chilling. Topher Mokrzewski and David Trudgen in BOUND, Against the Grain Theatre, 2018. Photo: Darryl Block Photography. The orchestra under Music Director Topher Mokrzewski played the intricate and eclectic score quite well. I found no balance issues with the singers, but the venue was very intimate, there wasn’t really anywhere for the music to go but in your ears - which is a good thing. Although this iteration seems to be much more of a display of the the transformation of the score in particular, I did miss the theatricality of the original staging. I missed the solitary cells, the cold ambiance, the interrogations by the state. I think these brought a lot of dramatic pathos to the the characters - seeing the struggle leading up to their musical outbursts. I look forward to seeing that return. Miriam Khalil and Topher Mokrzewski in BOUND, Against the Grain Theatre, 2018. Photo: Darryl Block Photography. BOUND v.2 is a stunning piece of music, and it is still only in its incubation stages. I look forward to the third and final incarnation.